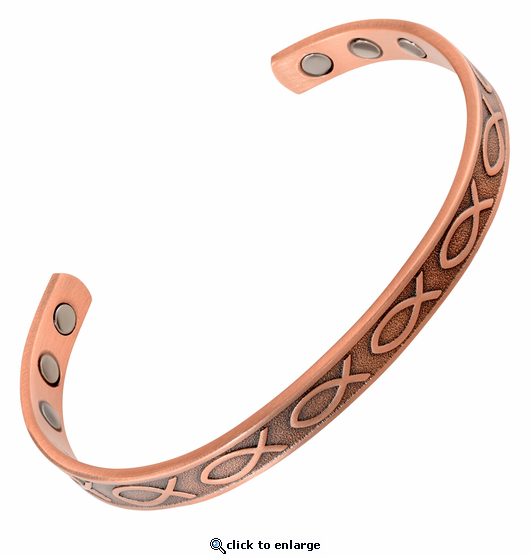 This is a finely crafted solid copper magnetic therapy bracelet. Styled in burnished copper with the ancient Ixthus or fish symbol, it has 6 powerful 3000 gauss neodymium rare earth bio north facing magnets and stainless steel magnet caps for added durability. This nickel free copper magnetic bracelet is about 1/3" wide. Since the items I ordered were for a Christmas gift for my son, I did not open the package to examine the contents. I plan to put the package as is in his stocking. I\\\'m sure he will be pleased with the bracelet and ring. Thank you again. I gave this bracelet to a friend and she just loves it!! Being able to squeeze it gently for a better fit is a plus! This Ancient Fish design is actually my second purchase from Magnet Jewelry Store.com. I have a current severe issue with damaged and torn ligaments and tendons in my left wrist/hand, and after reading several positive customer reviews claiming a large amount of relief coming from simply wearing a copper magnetic braclet, I figured for such small dollar investment on my end, what did I have to lose? Super fast customer service, super fast and Free s/h! and after wearing the Twisted Vine bracelet for the past few months, I know for a fact that the continual throbbing pain has slowly went away. So, I purchased the Ancient Fish copper bracelet, and same results have applied while wearing it on my right wrist/hand. It's not in my Head, as far as actual helping with my pain level; the swelling on my left wrist has actually decreased to a small amount! Great price point; excellent over the phone service with the young female customer service agent, fast delivery, product totally as described on there sites home page. Simply try the magnetic bracelet and you too will be glad you did! I love the design of this bracelet, LOVE IT!! I bought this copper bracelet to help with arthritis and to my surprise it has helped in my wrist and hand. Would love to have something for the knees.Reply by MJS: We are so happy to hear this. You may wish to consider our magnetic anklets for your knees. Perfect! Order came quickly and as ordered.